John Smedley and Producer Matt Higby were part of the SoE team that presented Planetside 2 at SyndCon, the annual guild meeting of The Syndicate, a guild that has been in existence since 1996 and works together to provide professional alpha and beta testing services as well as the writing for print as well as website game guides. 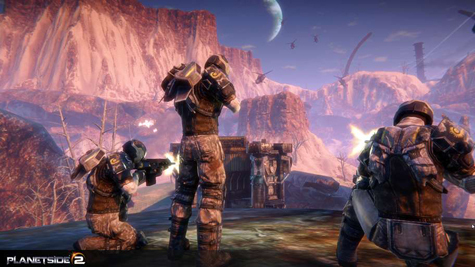 Planetside 2 is built on SoE's own proprietary engine, Forgelight and we were given close up shots of the graphic possibilities with Matt accelerating the day / night cycle while the audience "oohed and aahed" at the light changes in an early build of the game. We were also given close-up looks of models and the level of detail possible, down to scratches on the paint of armor. There will be a dynamic weather system that can affect warfare. Intense firefights causing a lot of smoke can affect the weather and they also spoke of volumetric clouds that can mask vehicles. That may not be in at launch, but is definitely in the long term plan. "The long term goal," said Smed, "is to have environment that is destructible." If players wreck a base totally, they will have to rebuild it before it can be useful again. He also alluded to EVE Online's outside-in approach in that they started with space and have since created on- planet game play while their plans are inside-out, with plans for space game play in the future. "We can build in extra detail where it is needed," said Matt as he pulled the camera in and out of landscapes and models. We saw the heat shimmer of super-heated air under vehicles, reflections of light off armor and the sun light striking the canyon at sunrise. There will be spotlights at night, on towers and on vehicles as well. "Imagine the old Looney Tunes prison break," Matt laughed, "with the spotlight following you as you try to escape it." Bases and outposts have attained greater variety, with some buildings built into the sides of stone walls, making the approach only, say 180 degrees, not 360. "We will start with a single planet and continent," said Smed, "then add more continents, and eventually planets." That brings up the possibility of naval and air transports between the continents as well as fighting on the high seas, refueling stations and floating bases - both on water and air. 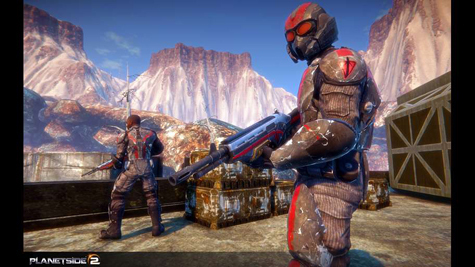 Planetside 2 will retain the same three factions, the Terran Republic, the Vanu Sovereignty and the New Conglomerate, but the three factions won't be battling over territory just to hold it for the sake of holding territory. There will be outposts that control certain resources and looking at the map, players can gain control and hold them for the purpose of denying another faction the use of the resources, or use them, themselves. The game will be able to re-allocate resources so that one strong faction won't be able to completely monopolize a single resource. They might deplete one type of ore and spawn another, or create an abundance in another non-controlled area. Matt then spoke on skills or as they are called in Planetside and Planetside 2, certifications. Planetside 2 will be much more of a skill-based game than Planetside was as the Forgelight engine is capable of the physics. For example, headshots will be possible and snipers will have a harder time of it, as ballistic physics will be in game and they will have to account for wind shift and bullet drop. The game will play very much like an FPS, with a keyboard layout that will be familiar to FPS players, however, there are leadership certifications as well as other support roles like medics and engineers. Certifications can be trained offline or on, with online training speedier than offline. Players can still be a Jack of all trades, and bring specific load outs into each battle, but specializing will get players higher level certifications faster. Throughout the presentation, we were told we could do this or that, provided we had the proper certifications. For example, Terran Republic players will be able put a powerful anti-vehicle weapon on top of the Prowler (a mid size tank) and swap them out as needed. If a player has the command rank and the certifications, they can command the base to raise specific turrets such as anti-personnel or anti-aircraft. Missions are area based, the objectives popping up as you enter an area, but leaders can also pick missions for the squad / outfit as well. Players respawn on death and if leaders have the certification, the respawned player may be able to drop-pod directly back to the group rather than making his way back from the respawn point in a camp or outpost. Friendly fire will be in game, which will make AE weapons more strategic and player sacrifices more meaningful. 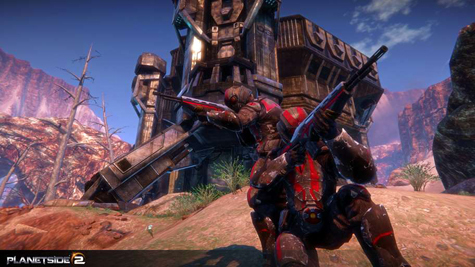 Each faction will have an uncontestable base and Outfit housing will also be a safe sanctuary. At FanFaire 2011, Smed had alluded to a cash shop, and he did the same here at SyndCon, reassuring the audience that they would not be selling power. If a weapon can be bought in the cash store, he was quick to assure us that it would be attainable in the game as well. Definitely though, one of the things that will be sold would be customization. SoE hopes to create a parallel feel for outfits that's like the US military, for players to recognize outfits for what they do, like how the 101st Airborne Division is known. To help with the identity, Outfits will be able to customize the look of their armor and vehicles. Leaders (with the right certifications) will be able to unlock abilities and customize the skill tree for the Outfit. Drilling down, an Outfit can have more than one Division, so they can have for example, a light assault Division, an Engineering Division and etc. Group play will be the same with 10 to a squad, but in addition, platoons of up to four squads can be formed. In summation, Smed had this to say of Planetside2. "Basically, we took everything that sucked out of Planetside and made all the fun things better."